Earlier restrictions on abortion focused on the “demand” side, mandating parental notifications and consent for minors and imposing waiting periods, for example. 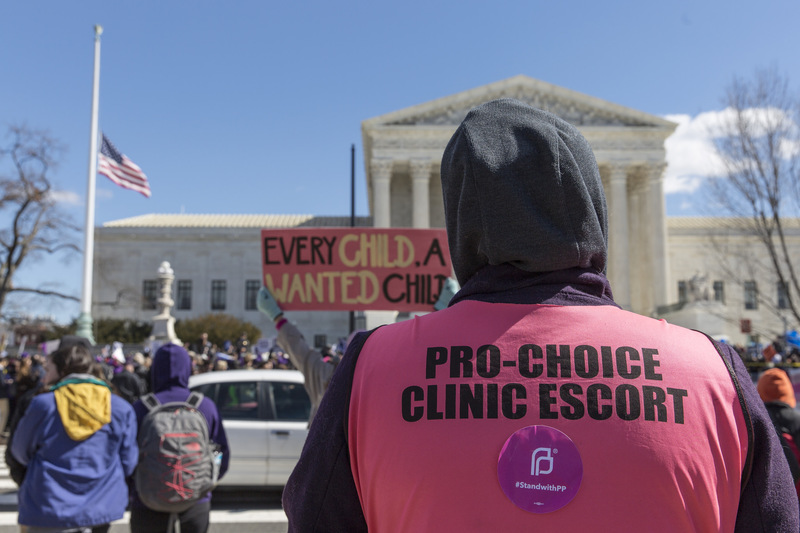 Today’s restrictions focus on the “supply side,” targeting abortion facilities. Two of the most consequential of these regulations are, on their face, aimed at patient health. These require that clinics are certified as Ambulatory Surgery Center (ASCs) and that abortion doctors have admitting privileges at a hospital within a certain distance of their practice. The ASC requirement stipulates that abortion clinics essentially transform themselves into small hospitals, with specifications around air flows, corridor widths, space for janitorial lockers, and specialized sinks—upgrades that can cost well over a million dollars—as well as compliance with the stringent sterility guidelines of hospital operating suites. 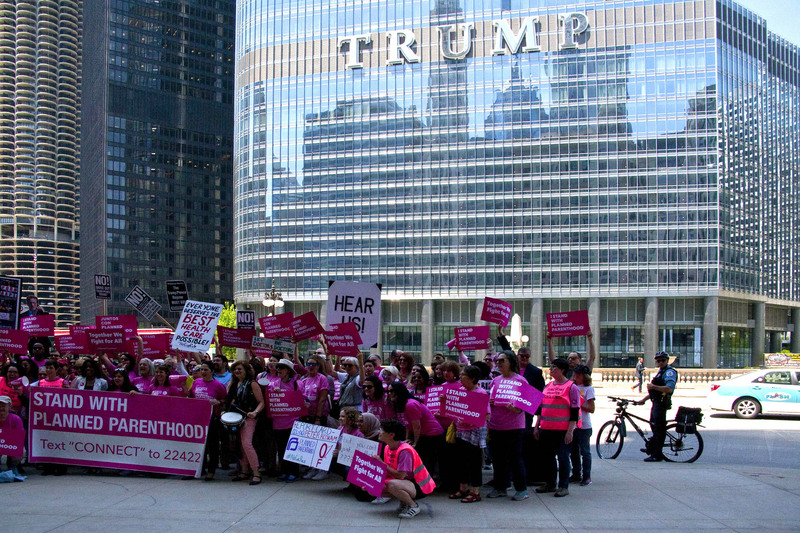 In May 2018, Chicago protestors come out against Trump’s imposition of the “global gag rule” on domestic health care providers, effectively stripping funding for all medical purposes should a clinic refer patients for abortions. Charles Edward Miller, Flickr CC. The hospital admitting privilege requirement is virtually impossible for many clinics to meet, but for two quite different reasons. The first is that, due to abortion politics, many local hospitals refuse to grant abortion providers admitting privileges. They don’t want to draw community protest. 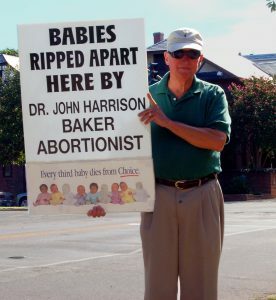 A notable case occurred when Dr. Willie J. Parker, a board-certified obstetrician/gynecologist and former medical school faculty member who trained at the University of Michigan and Harvard, among other institutions, sought to provide abortions in Mississippi’s sole clinic, but was refused privileges at every hospital to which he applied. 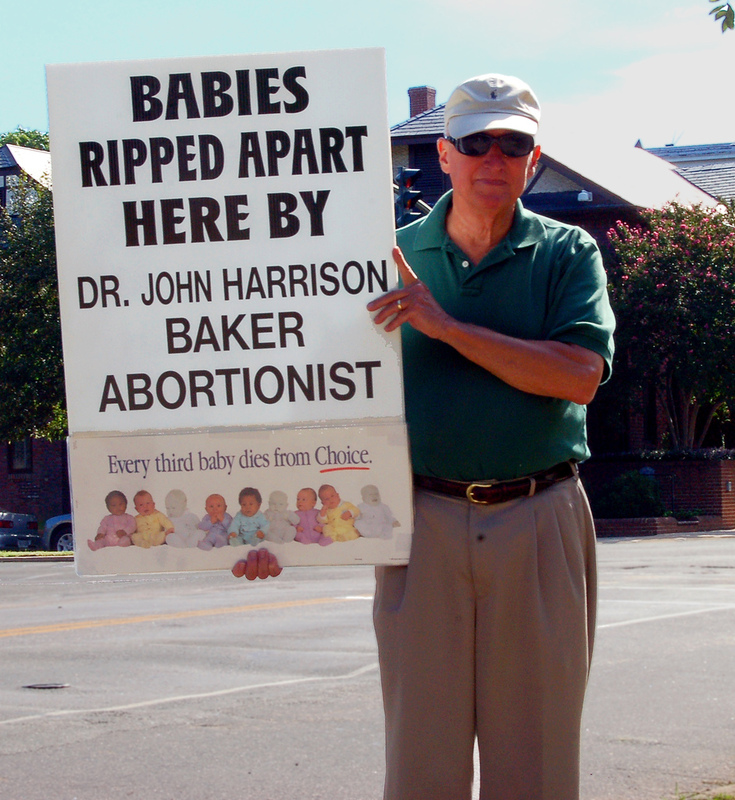 (Successful court challenges ultimately permitted Dr. Parker to perform abortions in the state). Yet another, quite ironic, obstacle for providers seeking admitting privileges is that many hospitals require any physician with privileges to have at least ten patient admissions per year. But abortion provision is so safe that it is extremely rare for any abortion doctor to have such an extensive record of hospital admissions. Tammi Kromenaker, the director of North Dakota’s only clinic, once commented to a reporter, “I would never employ a doctor who had to admit ten patients a year. That would mean they were a terrible doctor.” Kromenaker explained that her clinic had only one hospital admission in ten years. (Fewer than 0.3% of American abortion patients experience a complication that requires hospitalization, and these women typically present at an emergency room near their homes, often some distance from the facility in which their abortion took place). Indeed, the National Academy of Medicine recently reaffirmed the safety of clinic abortions and criticized numerous state restrictions for their negative impact on the quality and safety of abortion care. 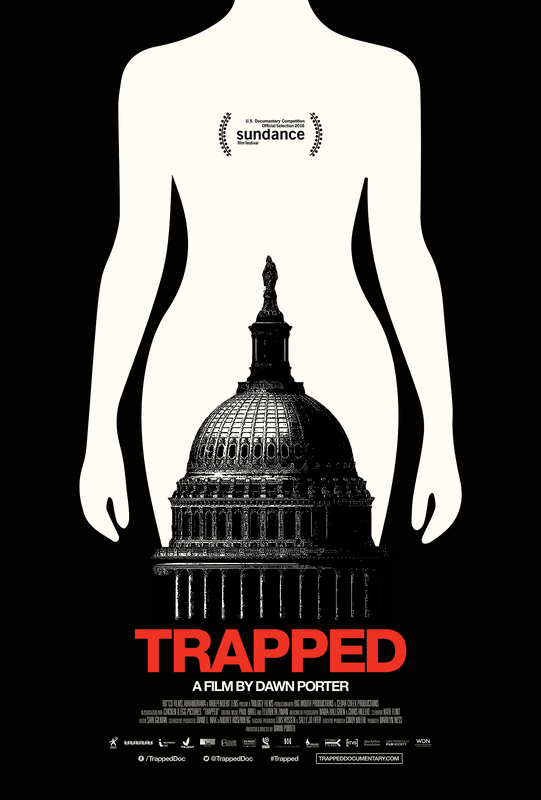 The poster for 2016 documentary, Trapped. The ASC and admitting privileges restrictions and others imposed on abortion clinics are called TRAP laws by pro-choice lawyers (Targeted Restrictions of Abortion Providers), and legal scholars say they reveal the extent of “abortion exceptionalism” in our political system. Observers note that in many of the states requiring ASC standards for abortion clinics, outpatient facilities offering procedures with comparable levels of complexity and risk—from vasectomies to sigmoidoscopies and minor neck and throat surgeries—are free of such requirements. Colonoscopies have a mortality rate 10 times higher than abortion but, in Texas, which has some of the most stringent abortion restrictions, colorectal health providers are not subject to ASC requirements. More than 160 clinics providing abortions have closed since 2011, in large part because they cannot meet regulatory demands. In this hostile environment, abortion rights supporters had a rare moment to celebrate in June 2016, when the Supreme Court, in the Whole Woman’s Health v. Hellerstedt case (WWH) overturned Texas’s ASC and hospital admitting privileges laws. The most immediate result was the continued operation of a number of Texas clinics that had been closed or were operating under temporary injunction. Had the decision gone the other way, the number of abortion clinics in Texas would have gone down to 10 from a previous high of about 40. (Currently, there are about 20 clinics in operation in Texas; a number of those that had closed were unable to reopen, as staff had dispersed and building leases had expired). Abortion rights supporters were additionally cheered because the Court’s decision signaled, for the first time, that restrictions on abortion must be based on scientific evidence rather than the political whims of state legislators. Many social scientists were particularly encouraged that the Majority opinion made ample use of the work of sociologists and public health researchers. Not surprisingly, researchers had extensively documented that the most severe consequences of abortion clinic restrictions would fall on the poorest women in Texas, who are disproportionately women of color. The elation was short-lived. Immediately after the decision, the state of Texas introduced yet more restrictions on abortion, including a requirement that fetal remains resulting from abortions be given funerals, a measure that would add considerable cost to the procedure and would upset many abortion patients. (This measure is currently in litigation). And though some states dropped admitting privileges and ASC requirements after the WWH decision, others did not, and “red” state legislatures continue to pass new restrictions. The biggest threat to abortion care nationally came just five months after the WWH decision, with the election of Donald Trump and his ardently anti-abortion running mate, Mike Pence. The new administration quickly nominated Neil Gorsuch to the Supreme Court. He is expected to be an additional vote to overturn Roe as soon as a relevant case reaches the Court. In June 2018, after this research was completed, Justice Anthony Kennedy announced his retirement, throwing abortion rights supporters into panic mode because of Trump’s declared intention to nominate “pro-life” justices. Just prior to Kennedy’s announcement, Gorsuch made clear his antiabortion sympathies, voting with the majority in National Institute of Family and Life Advocates v. Becerra, a decision that both released crisis pregnancy centers from the obligation to state their true antiabortion aims, and reaffirmed that abortion providers can be compelled to deliver state-mandated scripts to their patients. (As this article went to press, Trump’s nomination of Brett Kavanaugh, a judge with a longstanding record of hostility to abortion, has made the fate of Roe the leading issue in the confirmation battle). Many clinics have closed under this new regulatory regime; others remain open, striving to meet states’ requirements and provide care. 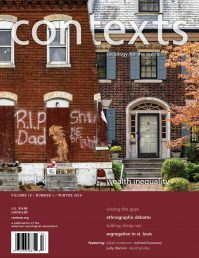 My conversations with some 50 abortion providers (including clinic directors and managers) over the past several years, both before and after the landmark WWH decision, reveal how challenging it has been to keep their clinics open and sustain the “woman-centered” abortion care that has been carefully developed over the past 45 years. A Richmond, VA protestor makes his objections personal in 2007. Taber Andrew Bain, Flickr CC. 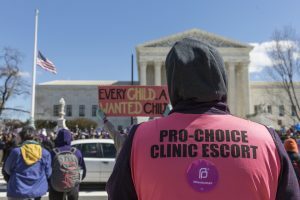 Clinic escorts, who endeavor to shield patients from aggressive protestors, have been a feature of abortion providers’ security and care teams for decades. Lorie Shaull, Flickr CC. Some inspections aimed to ensure clinic compliance with ASC regulations or other new guidelines. Others were responses to larger political events in abortion politics. For example, after the summer 2015 release of misleading “sting” videos about alleged sales of fetal tissue in Planned Parenthood clinics, one clinic director (not affiliated with Planned Parenthood) found agents sent by the state’s Attorney General knocking on her clinic’s door. “They said they were there to see if we were ‘selling baby parts.’” Some of the unannounced inspections were triggered by anonymous complaints; many were later revealed to have been made by anti-abortion groups. One director told me about an inspection prompted by a Facebook complaint left by abortion opponents. A Midwestern clinic staffer reported an agonizing occasion that followed quickly on her state’s governor declaring his presidential candidacy. The clinic had been regularly inspected for years, mainly without incident. “This year it was different. They were here for two days… they kept asking me to leave the room, and they’d get on the phone with somebody in [state capitol]. Then, they’d come back and ask to see such and such… I mean, it went on and on… someone else was pulling the strings.” A clinic director in the South recalled an inspection that occurred as the clinic was involved in a high-profile state-law challenge. It involved haz-mat clad nurses from the state health department sifting through the clinic’s garbage dumpster because abortion opponents had claimed, untruthfully, that aborted fetuses were being discarded there. As patients watched, the director said, “Our clinic was turned into a crime scene,” complete with yellow tape around the dumpster. Even where hostility is not blatant, repeated inspections disrupt clinic proceedings, demoralize staff, and upset patients, especially the unannounced inspections. Staff in one Midwestern clinic, which had recently seen an intensification of inspections, spoke about “men with guns” abruptly entering the clinic and “freaking out” both staff and patients. These were (routinely armed) Drug Enforcement Administration (DEA) agents who came, the staff believed, in response to an anti-abortion group’s “tip” regarding improper dispensation of drugs. The new regulatory environment of ever-stricter restrictions and heightened surveillance of abortion providers co-exists, of course, with the older restrictions still in force. Many of these, including such as waiting periods (mandatory time between when a woman is first counseled about abortion and when she can receive one) and state-mandated scripts for counseling patients, have been updated to impose even harder obstacles. For example, 24-hour waiting periods have been increased, in some states, to 48 or 72 hours. These delays are obviously problematic. In some cases, longer waiting periods can push a woman beyond the gestational limit for abortion in that state. Researchers estimate that some 4,000 women a year are turned away from abortion clinics because they arrive too late in their pregnancies. But even the 24-hour waiting periods can create havoc, especially in the 14 states where women have to appear in person for the first visit. Two separate clinic visits can mean two days of lost wages and two days of paying for childcare (some 60% of abortion patients have children, and nearly half of all abortion patients live below the federal poverty level and another 25% have incomes from 100-200% of that level). Further, since already-scarce abortion clinics tend to be located in metropolitan areas, rural women may face six hours or more of driving to get to their clinic. Thus waiting periods mean finding places to stay in the city and, because many abortion patients are low-income, patients and sometimes their family members are forced to spend one or more nights sleeping in their cars in the clinic parking lot. These kinds of counseling mandates are troubling in several ways: first, they force staff to violate professional ethics by telling their patients falsehoods. Additionally, spending time delivering false and often upsetting messages to patients detracts from what counseling staff want to accomplish: discussing patients’ feelings about the upcoming procedure, answering questions, and ascertaining that the patient is not being coerced into an abortion. Clinics now commonly warn patients about protestors and station volunteers outside to greet patients and try to shield them from aggressive protestors, yet clinic staff report that some patients remain very upset after such confrontations. In some situations, the noise filters into clinic counseling rooms, and staff are reduced to playing loud music to drown out the protestors. Similar to the mandated counseling scripts, calming down patients shaken by protestors takes time away from the counseling staff feels is actually necessary. The chaotic environment in which much of abortion provision takes place today involves a new round of challenges to the personal safety of providers and patients. Since Trump’s election, the National Abortion Federation reports increases in aggressive incidents—stalking, vandalism, bomb threats—at clinics. Starting in the fall of 2017, clinics have even experienced “invasions” involving extremists bursting into clinic waiting rooms and accosting patients—activity not seen in the U.S. since the early 1990s. Most fundamentally, providers remain firm in their commitment to one of the basic tenets of woman-centered care: that there is no “one size fits all” model of abortion. In practice, this means each woman must be “met where she is at,” in the common phrasing of providers. The majority of patients who appear resolved to have an abortion are given information about the procedure, have any questions answered, are offered routine counseling, and, as is standard in abortion facilities, are queried as to whether coercion is involved in their decision. The small minority of patients who present as deeply conflicted about their decision—for example, saying, “God will never forgive me”—are offered more extended counseling, and, in rare instances, have their abortions postponed to allow them more time for reflection. Americans United for Life. 2016. Model Legislation and Policy Guidelines. The “playbook” for antiabortion legislators, from a national legal group, this document has inspired numerous state-level restrictions. Esme Deprez. 2016. “Abortion Clinics are Closing at a Record Pace,” Bloomberg News. Explains the impact of abortion restrictions on clinic closures and reveals the geographical distribution of such closures. Carole Joffe. 2010. Dispatches from the Abortion Wars: The Costs of Fanaticism to Doctors, Patients and the Rest of Us. Boston, MA: Beacon Press. Discusses the “woman-centered” model of abortion care providers are struggling to sustain. Willie Parker. 2017. Life’s Work: A Moral Argument for Choice. New York: Simon and Schuster. A memoir by a physician whose strong Christian beliefs led him to care for women in his native South. Dawn Porter. Trapped. 2016. trappeddocumentary.com. 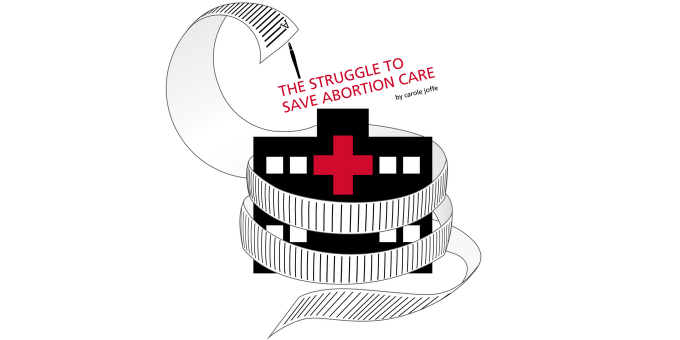 The film demonstrates how abortion restrictions affect providers and patients. Carole Joffe is in the Advancing New Standards in Reproductive Health program in the department of obstetrics, gynecology, and reproductive sciences at the University of California–San Francisco. She is also an emerita member of the department of sociology at the University of California–Davis. With David Cohen, she is working on a book about barriers to abortion care. Synchronization is so important for every windows 10 operating system and this Online tutorial teaches sync files windows 10 how to do this process easily.